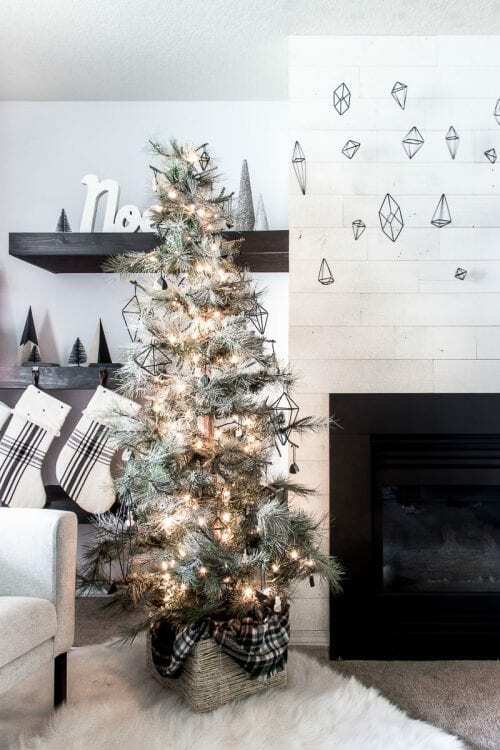 This minimalist Christmas tree is so simple and modern with the himmeli ornaments, geometric shapes, and limited materials. Love these decor ideas! 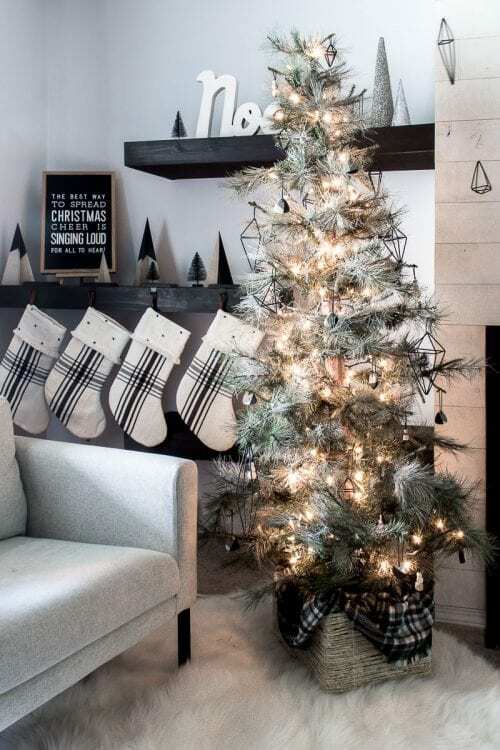 After our over the top ombre Christmas tree last year, I knew I wanted to go simple and minimal this year. I convinced Justin to let me put up one tree early and I’m obsessed with how it turned out. Let me show you our minimalist Christmas tree and some of the decor we have. 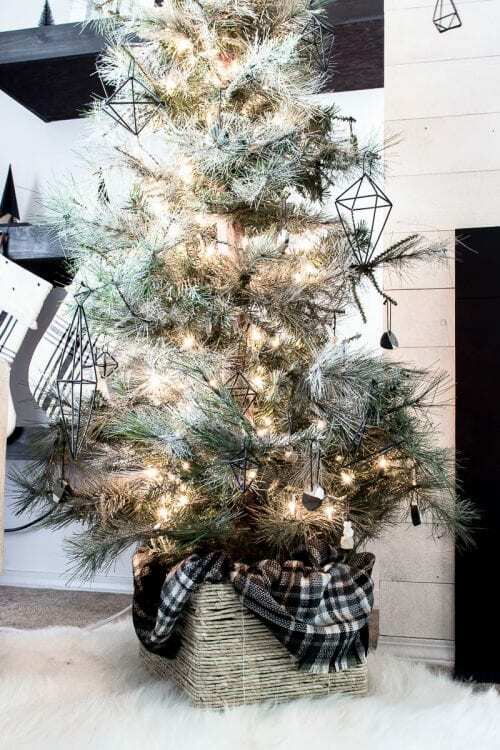 Who said decorating your Christmas tree has to be complicated? Our minimalist Christmas tree is my favorite I’ve ever decorated and so, of course, I had to share it with you. Plus, you’ll never guess where I got our tree from! I knew I wanted a skinnier tree than we typically have and more sparse. Imagine a Charlie Brown tree and that’s what I was picturing for our tree this year. Since no tree farms open in Oregon earlier than mid-November, I was having a really tough time finding a tree to chop down, so I turned to my trusty best friend, Amazon Prime, to help me out. 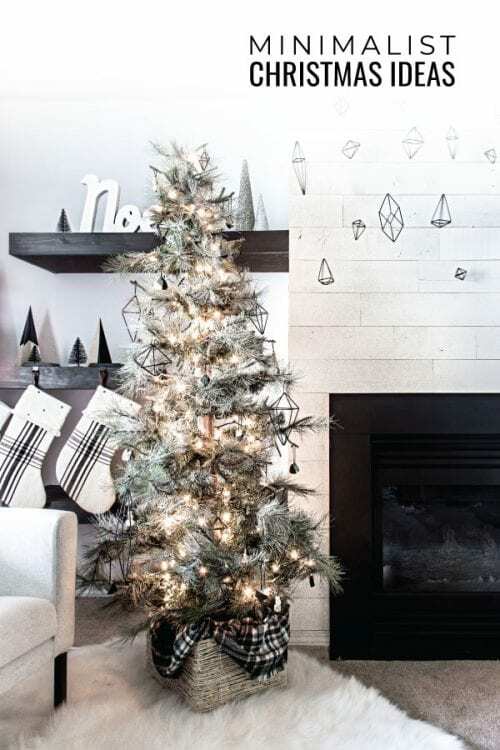 Would you ever guess that this tree came from Amazon Prime and was LESS THAN $100? Score!! I was tired of using the same generic tree so went on a hunt for a simple, more sparse tree to use this year. I love how this one looked and wasn’t super tall. I did want a more flocked look this year so added some spray flock to the tree before decorating. The basket I grabbed at Joann’s with a 40% off coupon and the plaid throw in the basket is actually just a scarf I nabbed from Cents of Style when they were running a $10 sale on scarves. 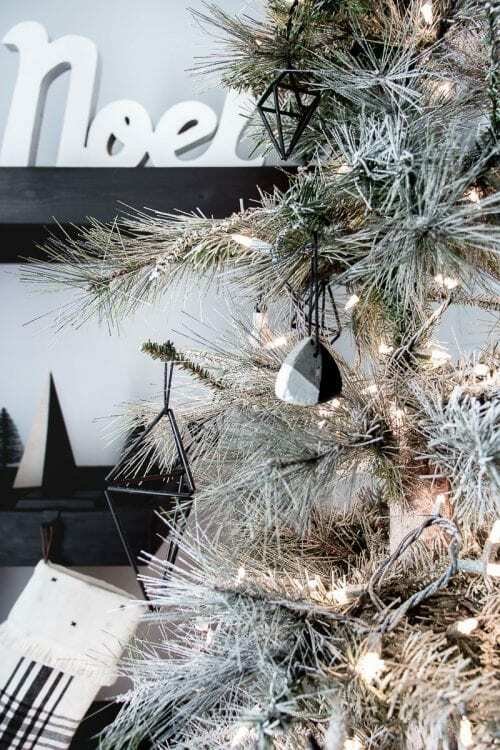 Did you see our modern Christmas ornaments I posted about last week? Check out the tutorial on how to make himmeli ornaments and the concrete ornaments. They turned out so cute and were the perfect, simple ornaments for our minimalist tree. 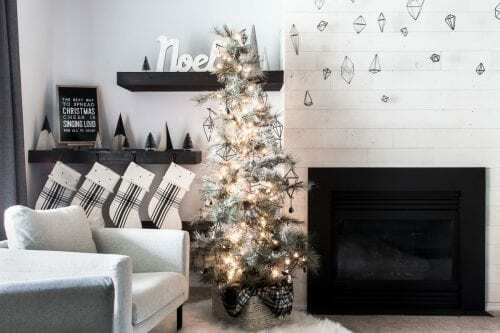 I had enough himmeli ornaments left over after decorating the tree that I was able to hang them above our fireplace with fishline for some simple winter fireplace decor. Related: Check out our one-day fireplace makeover project we tackled a few weeks ago. 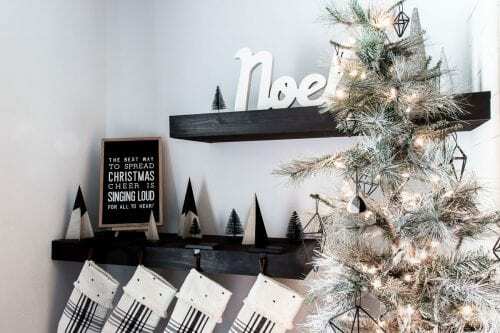 Although I’m obsessed with our tree, I think the simple wood Christmas trees on the shelf might be my actual favorite. I just used 1/16” birch plywood and cut out triangles in three different sizes using a self-healing mat and utility knife. After making a nice slit halfway through each triangle the width of the board and adding some black paint, they fit together perfectly and look so cute on our shelf.